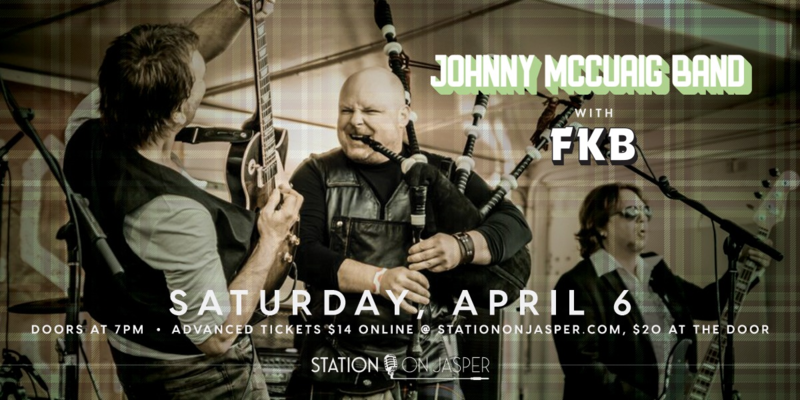 Station on Jasper presents the Johnny McCuaig Band, an electrifying Canadian band consisting of Johnny McCuaig- lead vocals, bagpipes and rhythm guitar, James Picton Lead – guitar and vocals, Allen Morrison – rhythm guitar and vocals, Kevin Kyle – Bass and vocals, and Dan Barton – Drums, percussion and vocals. Their brand of melodic ear candy becomes a feast for the senses. Bagpipes, a kilt, crunching guitars, a hip-shaking rhythm section, and boundless energy makes for a one-of-a-kind show. Doors for the show open at 7:00pm, but come in early and try out our new menu!